Monarch Air Group provides private air charter in Jacksonville, FL. Our clients benefit from top-notch service, unrelenting dedication to safety, wide selection of aircraft, and years of experience in chartering private jets. To obtain a free quote, please use our online quoting tool provided below, or call toll free 1-877-281-3051. Monarch Air Group offers private jet charter services to and from Jacksonville, FL, USA. 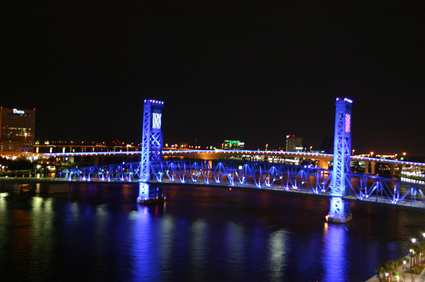 Jacksonville is the largest city in the U.S. state of Florida. With its convenient location, mild climate, and relatively inexpensive living cost, Jacksonville is a perfect family vacation and the best place to conduct business. The city of Jacksonville has one of the largest urban park systems in the country and offers miles of beaches and waterways. The city has something to offer for everyone from symphony orchestra, sport and entertainment complex to exclusive shopping. 1. BQK, Glynco Jetport, Brunswick, United States. 3. GNV, Gainesville Regional, Gainesville, United States. 4. JAX, Jacksonville,, Jacksonville, FL, United States. 6. NEN, Olf Usn, Whitehouse, United States. 7. NIP, Jacksonville NAS, Jacksonville, United States. 8. NRB, Ns, Mayport, United States. 9. SSI, Mckinnon, Brunswick, United States. 1. Omni Jacksonville Hotel, 245 Water Street, Jacksonville. 2. Extended Stay America Jacksonville – Riverwalk, 1413 Prudential Drive, Jacksonville. 3. The Strand SouthBank, 1401 Riverplace Boulevard, Jacksonville.